I've recommended this book to Year 6 + who don't mind something a bit scary. There's a great concept behind it and the book went rapidly from person to person when we had a class reading for the Children's Choice selection process of the New Zealand Book Awards for Children and Young Adults in 2015. 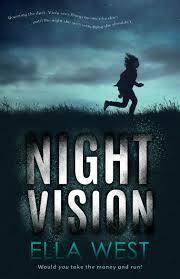 You can read author Ella West's blog and the exciting news that the NZ Film Commission has provided funding for a film script to be written of Night Vision. You can also follow her on Facebook. 14-year-old narrator Viola is an only child living with her parents on an isolated Canterbury farm. She has Xeroderma Pigmentosum, or XP, which makes her allergic to sunlight. She sleeps in the daytime and at night spends time on the internet, does her music practice (she and her mother play the viola) and correspondence lessons, even helps with some farm tasks, and roams outside wearing her night-vision goggles. The story opens with drama; one night Viola witnesses a crime. A man buries a lot of money by a tree before burning a car with a man inside. Viola takes the money and starts drip-feeding it to her parents anonymously to help with their financial difficulties which she feels responsible for. When an article appears in the paper about Viola and her XP the criminal puts two and two together and tracks her down. 10-15.